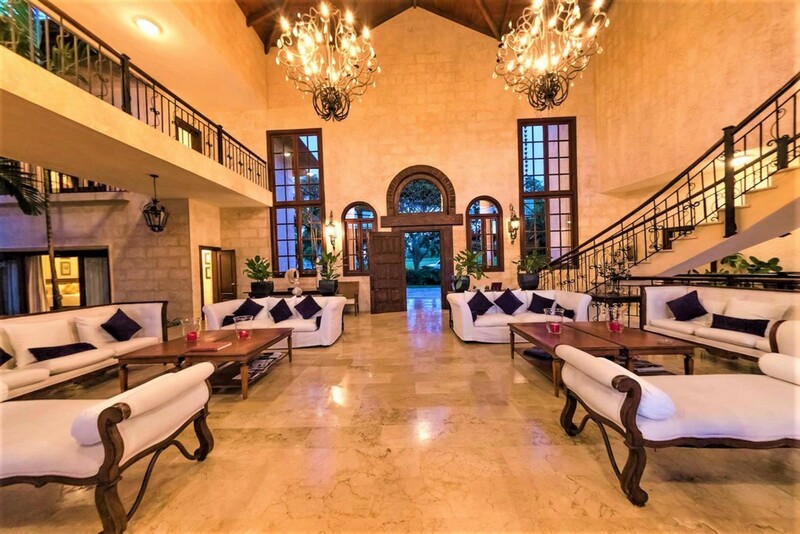 Welcome to Barranca 21 a luxurious 9-bedroom villa nestled in the exclusive resort Casa De Campo on the southeastern shore of the Dominican Republic. 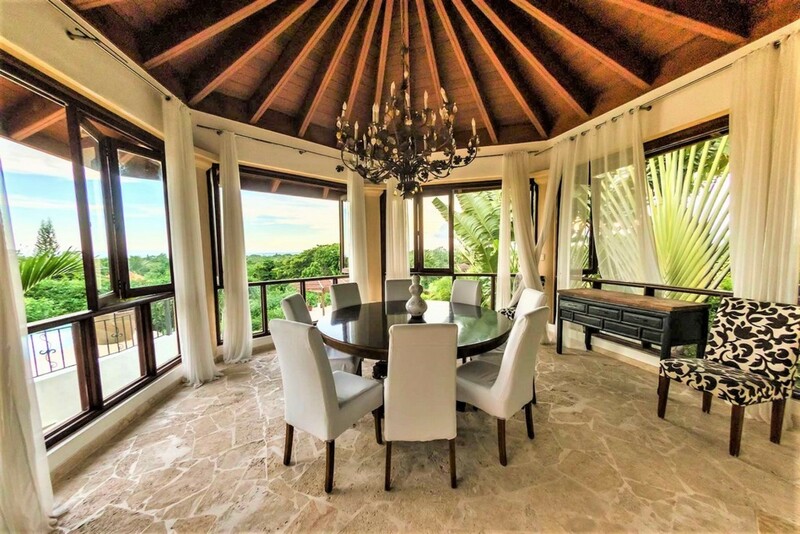 This luxurious property has incredible views of the surrounding resort of vivacious greenery and tropical plants as well as ocean views that span off in the distance. The private resort is embedded across 7,000 acres of land and includes a variety of leisurely amenities for you to use at your fingertips. 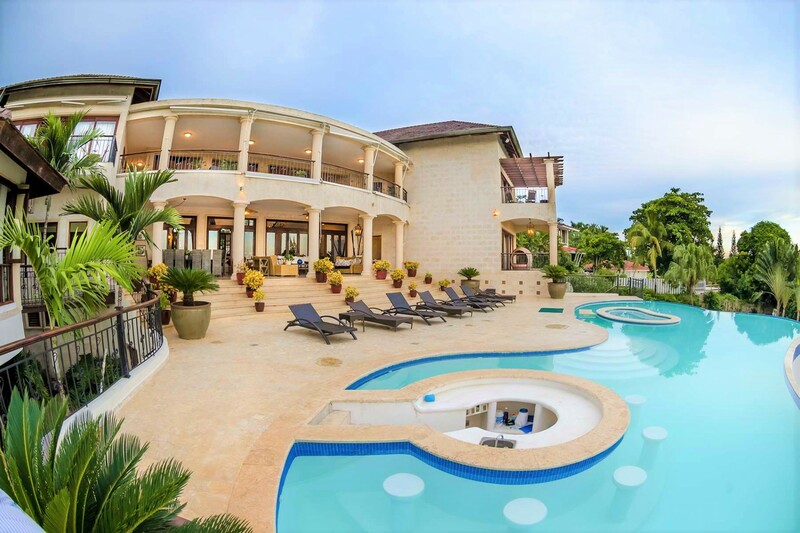 This oceanfront community provides you with a very tranquil and peaceful vacation as well as a luxury villa for you to indulge in. 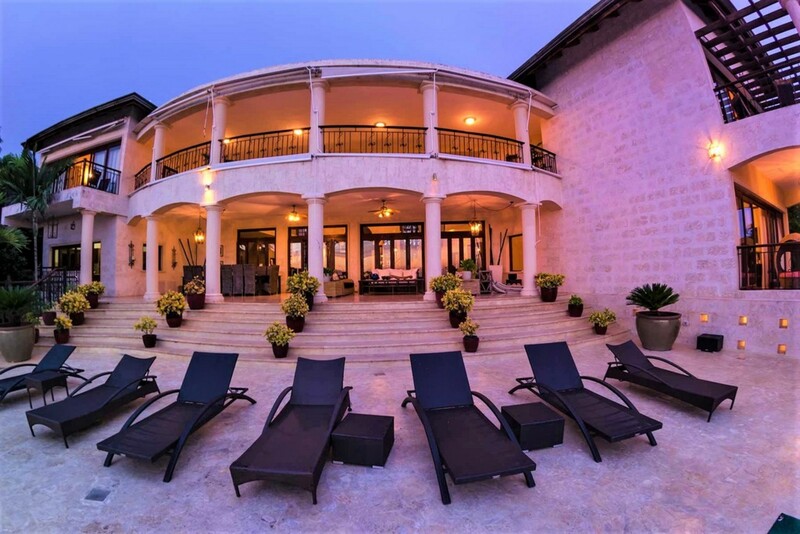 This luxurious villa can accommodate up to sixteen guests in total, across its nine bedrooms, eleven bathrooms and spacious living areas both indoors and outdoors. 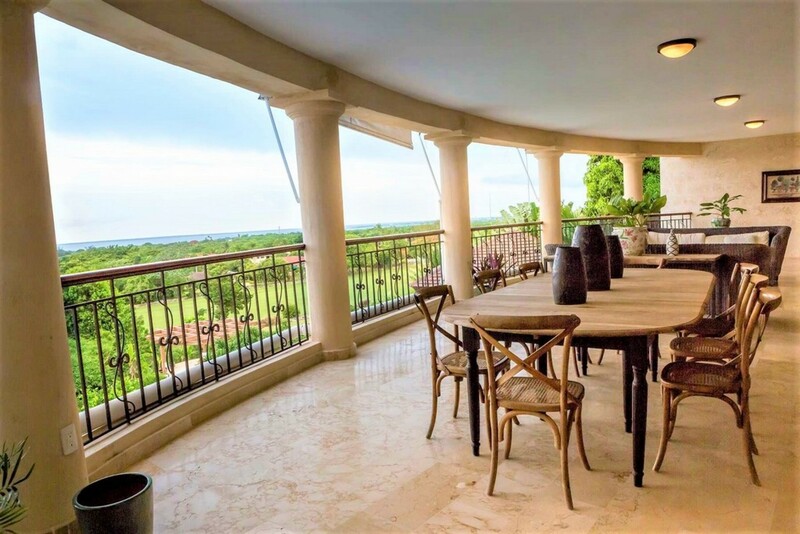 This sophisticated and lavish home is located on the third hole of the Links Golf Course offering a spectacular view of Casa de Campo and a 180-degree view of the Caribbean Sea with an unobstructed view of spectacular sunsets each evening. 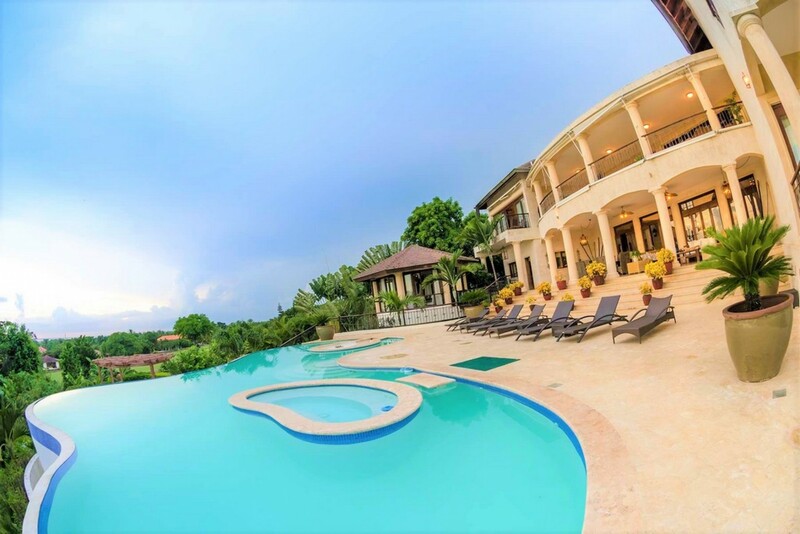 The Villa is surrounded by lush tropical palm trees and vivacious plants that grow all around the villa. Step out onto the large terrace and experience the breeze rustling through the plants as they chatter. 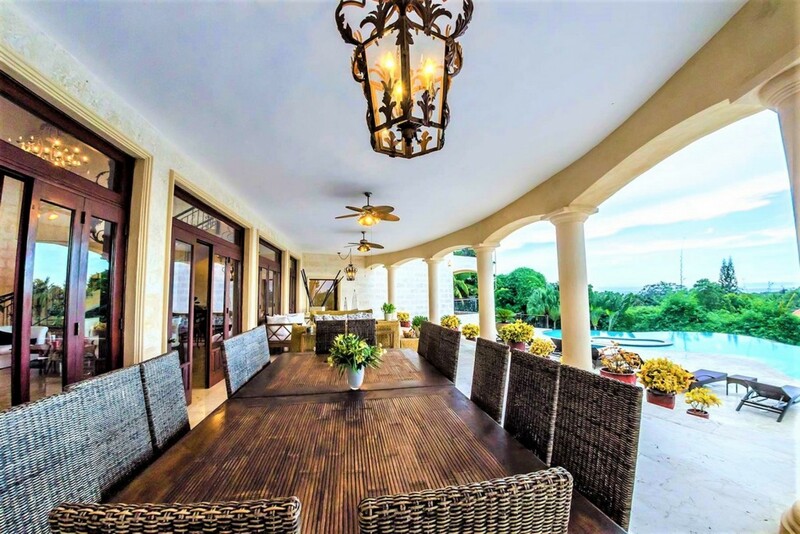 All this scenic beauty is surrounded by a 3000 ft outer deck and living area with a beautiful gazebo, perfectly designed for outdoor entertaining and dining. The terrace embeds a large and private infinity pool at its center and its color crisp waters are refreshing to take a morning swim in. The sun loungers are laced around the pool and enjoy the views of the glistening water of the pool, the tropical location and the views of the ocean in the distance. Relax on the sun loungers as you soak up the suns radiance. Maybe even indulge in some alfresco dining as you enjoy a tangy Caribbean breakfast to set you up for the day. The covered dining area can seat up to ten guests. The spacious outdoor space is perfect for you to walk along the well-maintained lawn barefoot and to explore the gardens around the villa. If you want some seclusion from the sun, then nestle in the private gazebo with your favorite book as you cool off and unwind. In the calm evenings watch the sky burst into a firework of colors as the sun sets in the distance. You can slip into the Jacuzzi with a homemade cocktail or sit up on the secluded balcony as the stars sparkle above you. 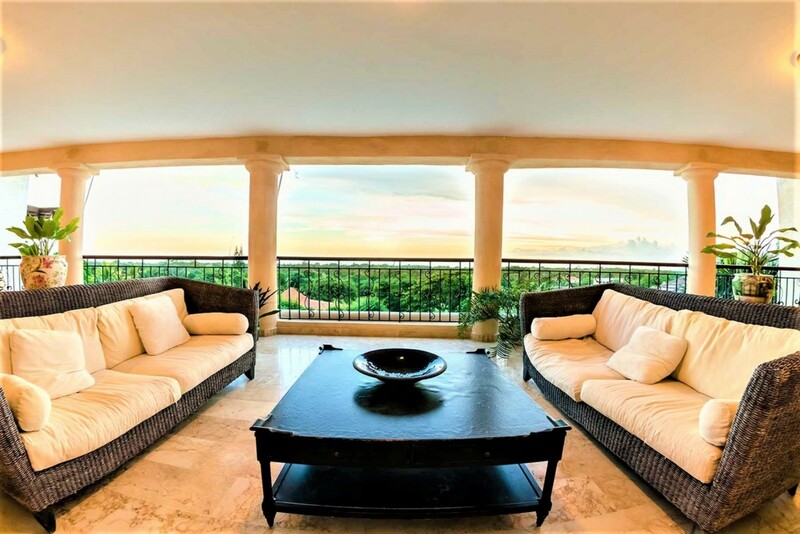 Enjoy the incredible views of the ocean and look out over the Saona and Catalina Islands that seem to fall directly from your sixty-foot infinity pool and Jacuzzi. 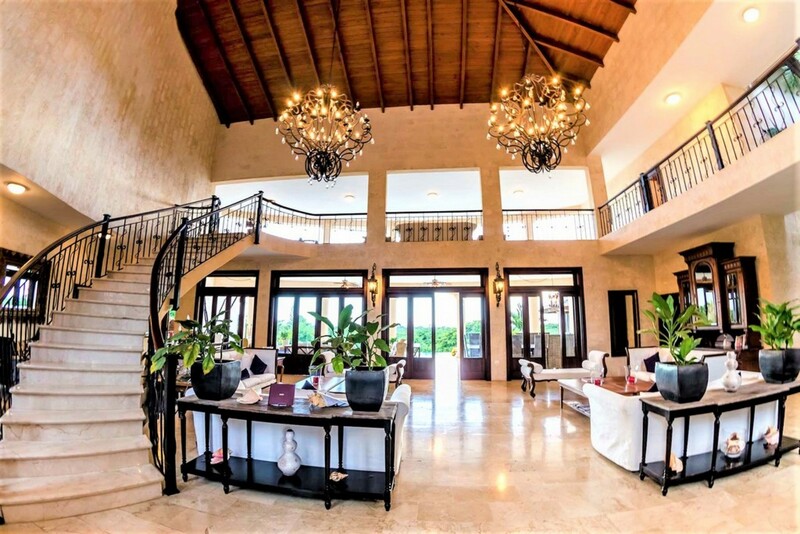 This extraordinary villa is made up of two levels, the ground floor, and the first floor. 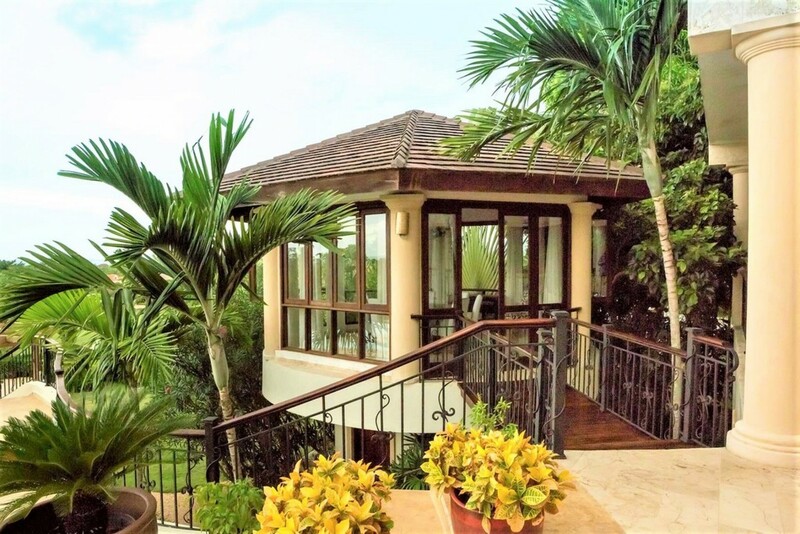 The villa boasts two-story interior gardens that provide you with a unique indoor and outdoor Caribbean island experience. The ground floor is where you will discover the main living areas. Here the living, dining and kitchen area open out into a spacious room. 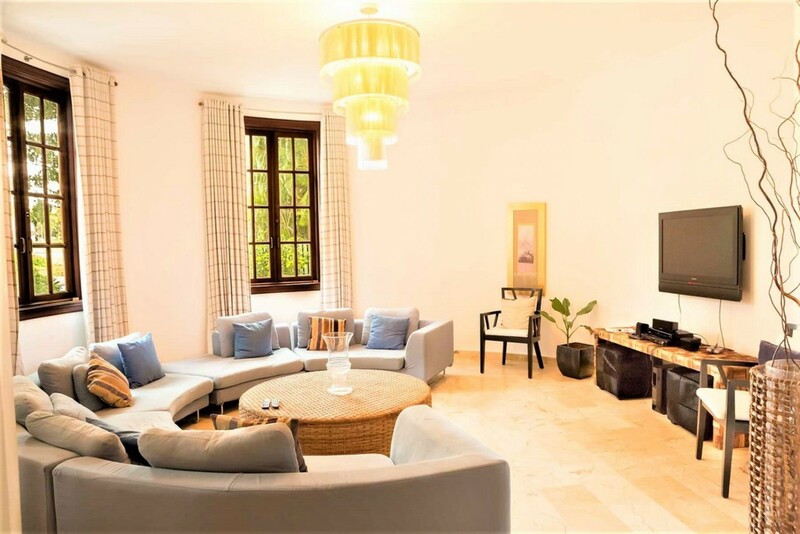 The grand living area is fitted with elegant high-rise ceilings that open to the second floor. The main staircase curves up and around the room leading you to the bedrooms. The living area is decorated with potted plants and gleams with crisp marbleized floors and walls. 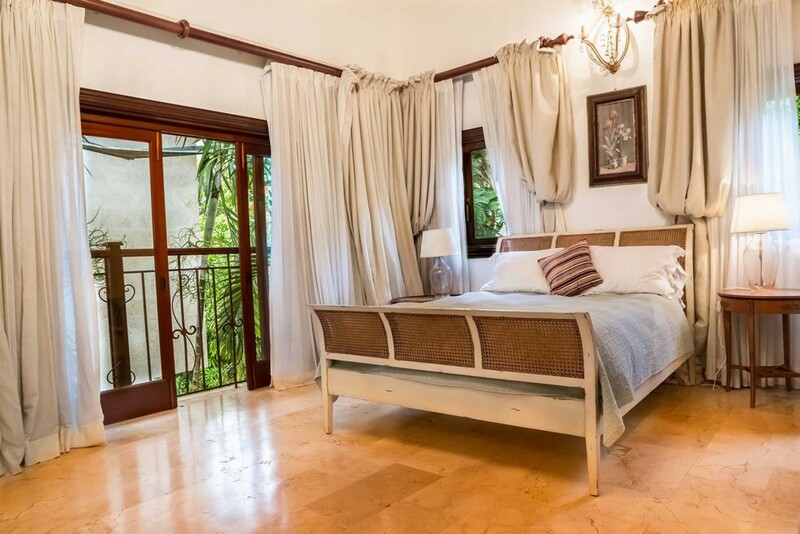 The furniture is a rich caramelized brown and the large windows and doors lead you directly out onto the terrace. 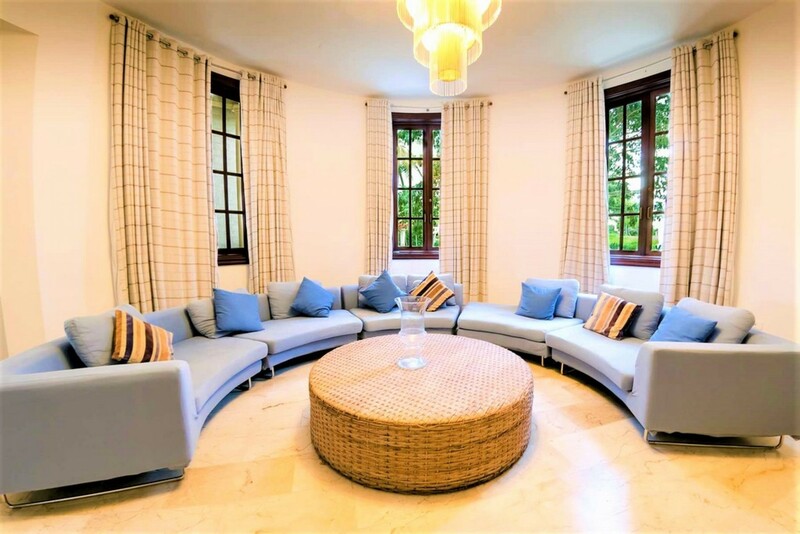 There are four large plush sofas can seat all your guests as you relax here during your stay. 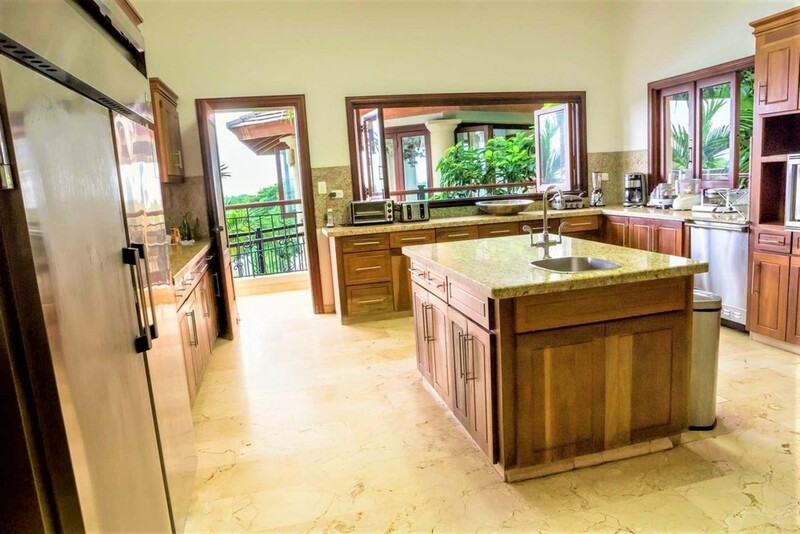 The kitchen in the villa comes fully equipped and ready for you to use if you wish. You can also have you professional chef prepare and cook meals for you. 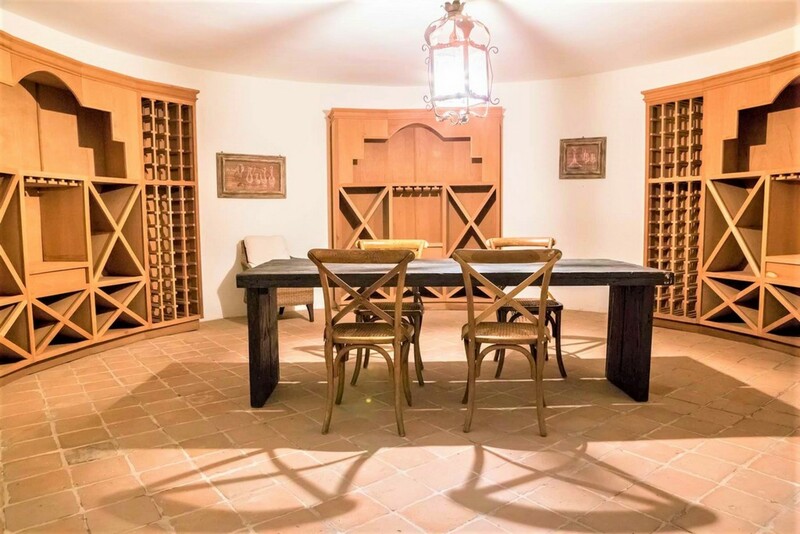 As dinner is being prepared your guests can relax in the media room that is climate controlled. Here you can watch your favorite film or listen to music as you enjoy some light snacks. All the formal interiors are air-conditioned including the dining room also. 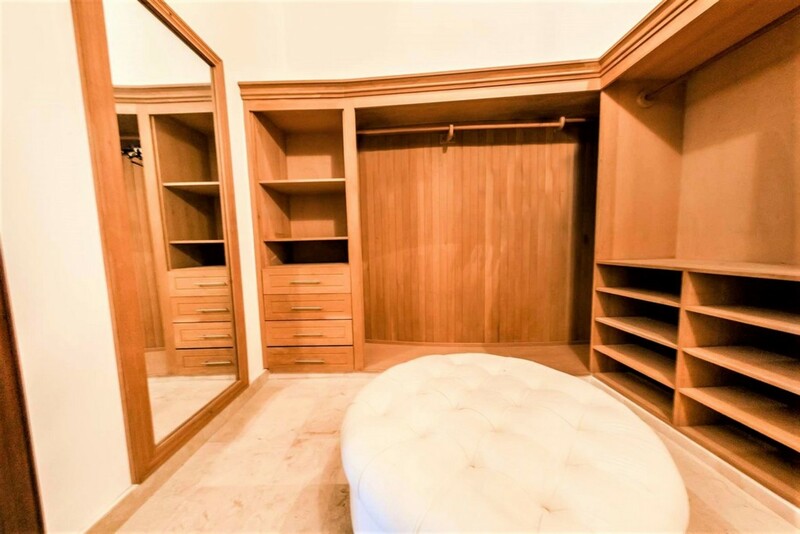 Cacique 21 has a total of nine bedrooms altogether. 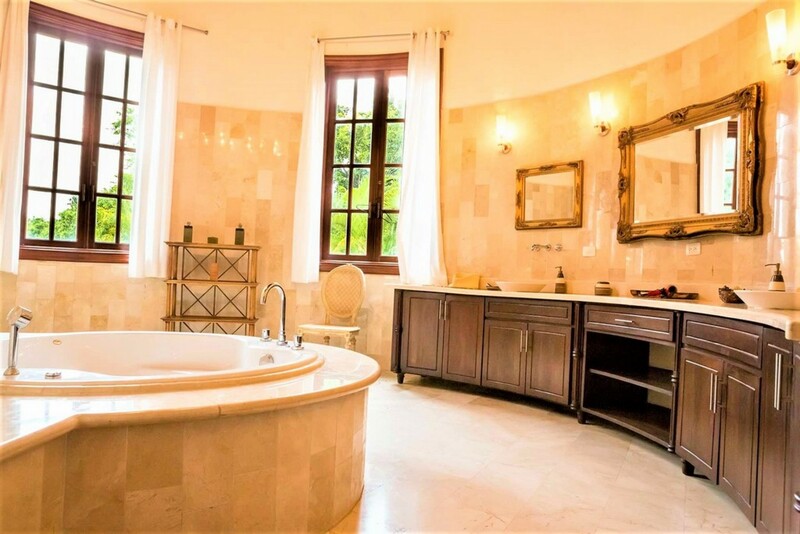 The bedrooms all enjoy their own private en-suite bathrooms, air-conditioning and views of the surrounding area. 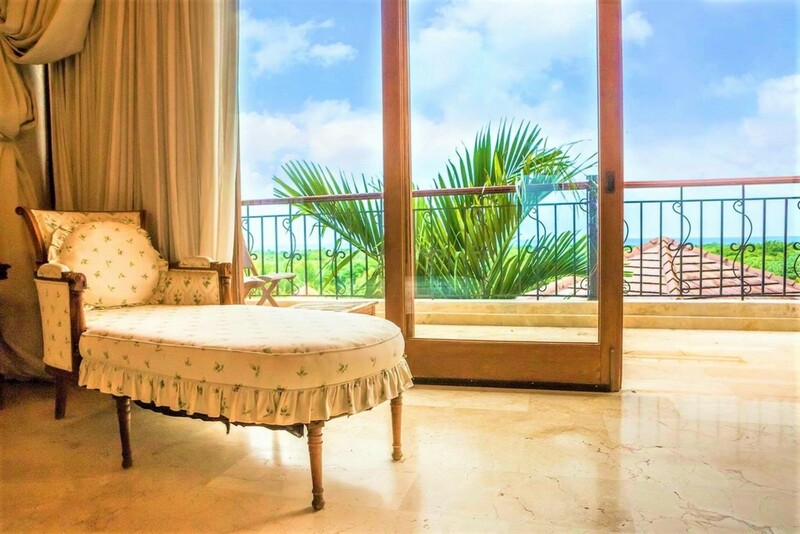 The master bedrooms enjoy views of the ocean on the balconies and are fitted with luxurious king-sized beds. There are two more bedrooms with king-sized beds and five with queen-sized beds (three of the bedrooms have two queens sized beds each). The bedrooms are designed with lavish linens and designed with a chic, modern touch, indulging in space and many luxurious features. 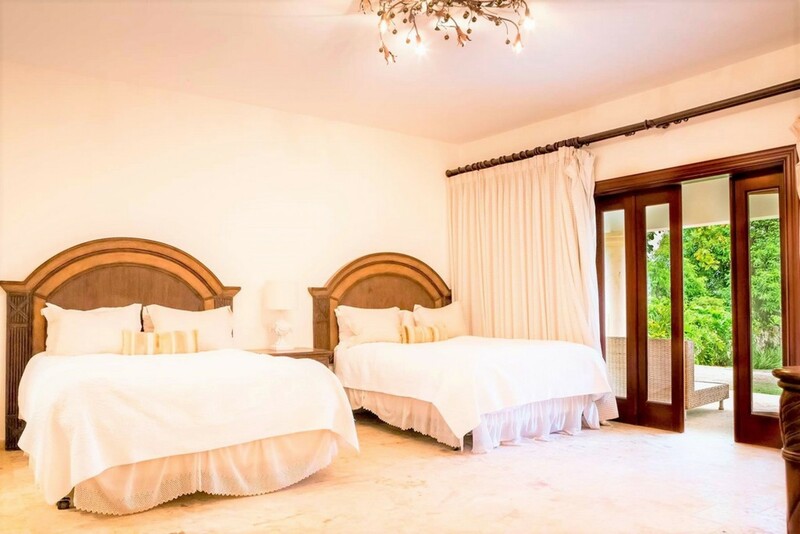 BEDROOM 1 Master: Luxurious King-sized bed, Private En-suite Bathroom, Air-conditioning, Access to private Balcony, Ocean Views. 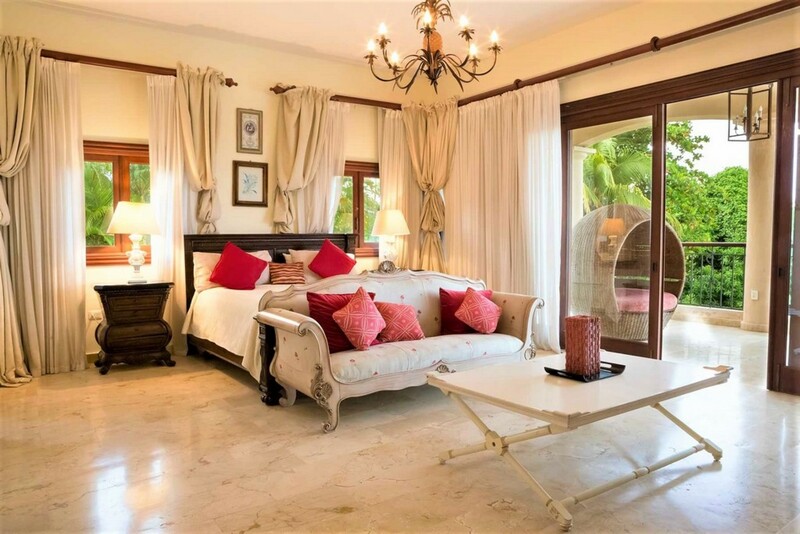 BEDROOM 2 Master: Luxurious King-sized bed, Private En-suite Bathroom, Air-conditioning, Access to private Balcony, Ocean Views. 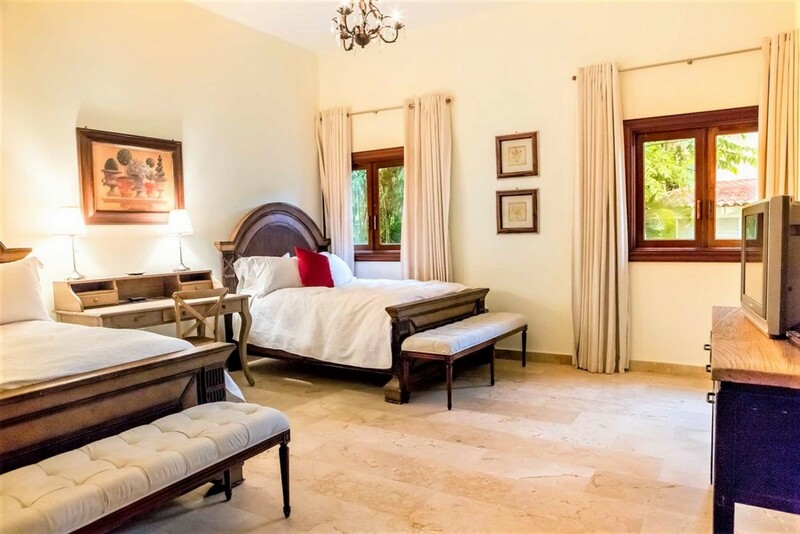 BEDROOM 3: Luxurious King-sized bed, Private En-suite Bathroom, Air-conditioning. 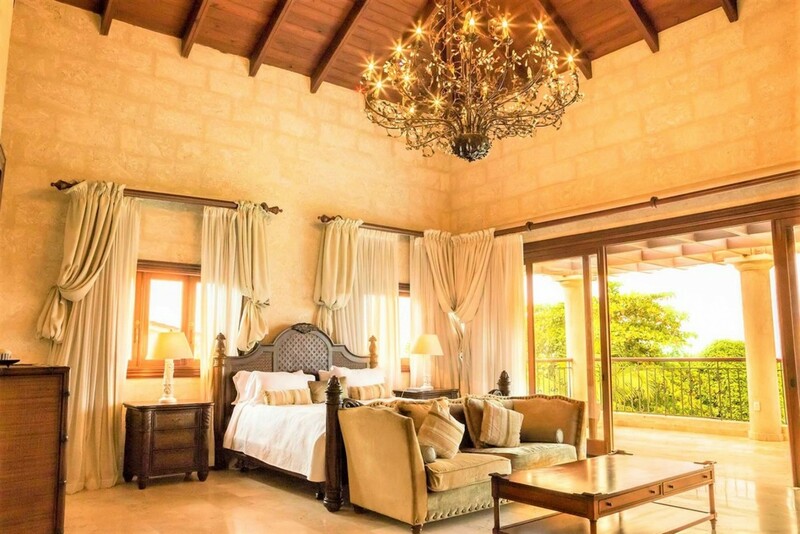 BEDROOM 4: Luxurious King-sized bed, Private En-suite Bathroom, Air-conditioning. 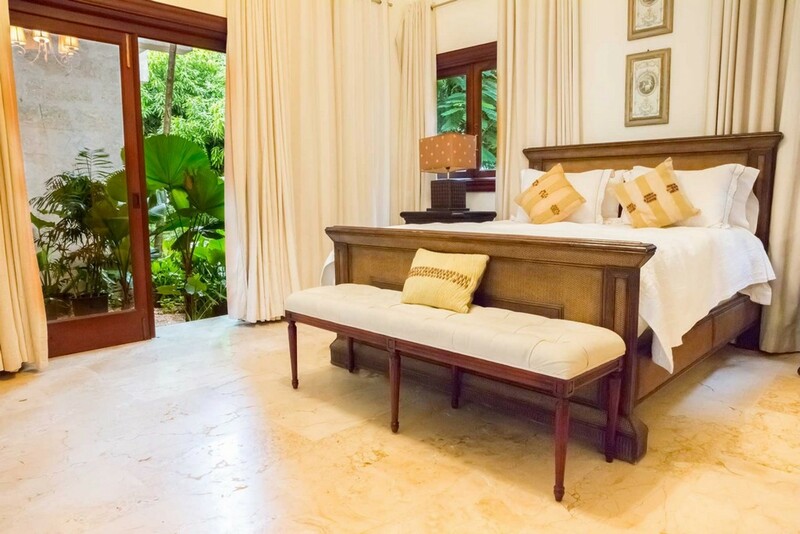 BEDROOM 5: Comfortable Queen-sized bed, Private En-suite bathroom, Air-conditioning. BEDROOM 6: Comfortable Queen-sized bed, Private En-suite bathroom, Air-conditioning. BEDROOM 7: Two Comfortable Queen-sized bed, Private En-suite bathroom, Air-conditioning. BEDROOM 8: Two Comfortable Queen-sized bed, Private En-suite bathroom, Air-conditioning. BEDROOM 9: Two Comfortable Queen-sized bed, Private En-suite bathroom, Air-conditioning. 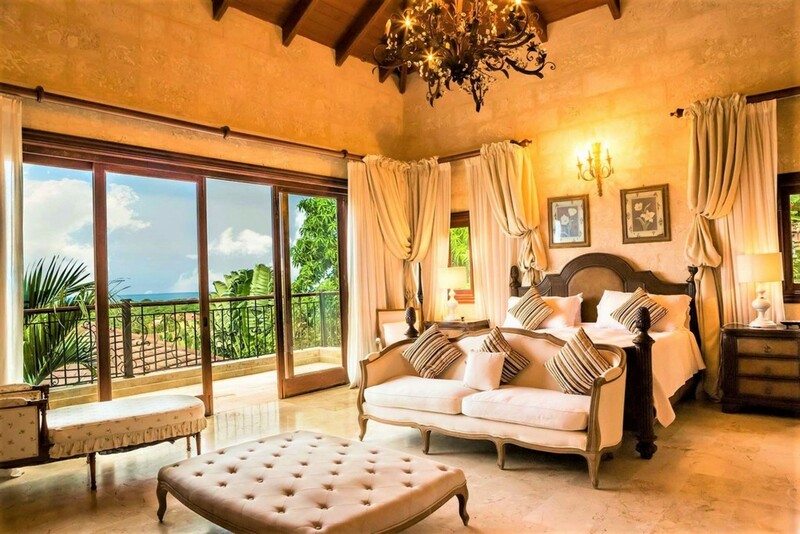 The villa is nestled in the exclusive resort Casa De Campo on the southeastern shore of the Dominican Republic. The private resort is embedded across 7,000 acres of land and includes a variety of leisurely amenities for you to use at your fingertips. 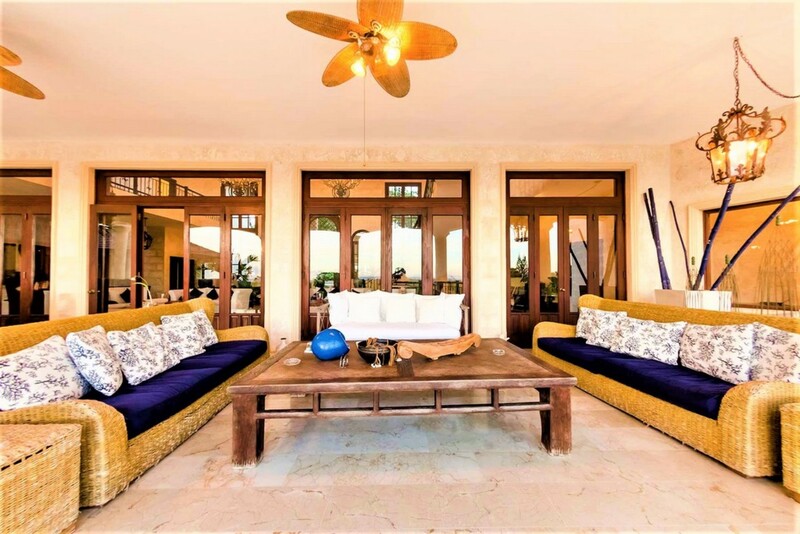 This oceanfront community provides you with a very tranquil and peaceful vacation as well as a luxury villa for you to indulge in. The Dominican Republic is the second largest and most diverse Caribbean country. It is renowned for its comfortable climate and vivacious tropical vegetation. The intriguing history that this location provides is rich in traditional culture. Surrounded by the Atlantic Ocean on the north and the Caribbean Sea on the south, this enchanting island has 250 miles of world-famous beaches, with white sugar-fine sand and clear crystal waters.Casa de Campo is located on the beautiful southeastern shores of the Dominican Republic, next to the town of La Romana. 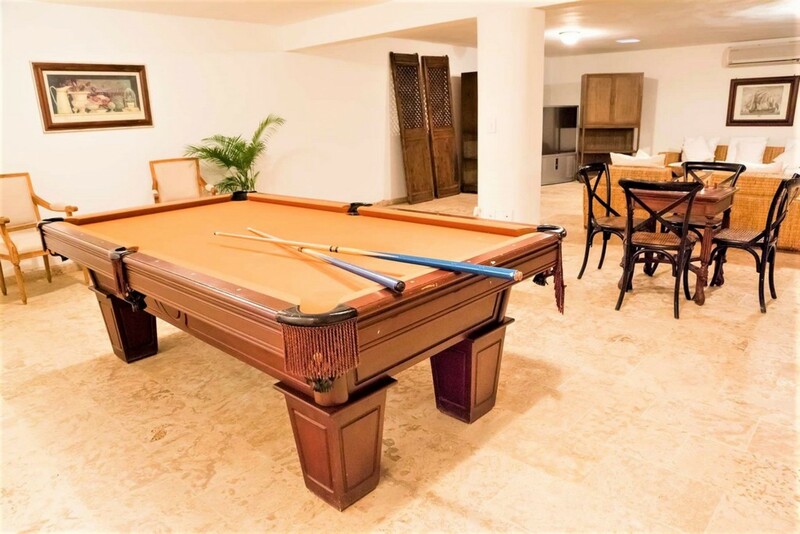 The Villa is situated just over 70 miles from the capital city of Santo Domingo, the oldest most culturally enriched city in the new world. 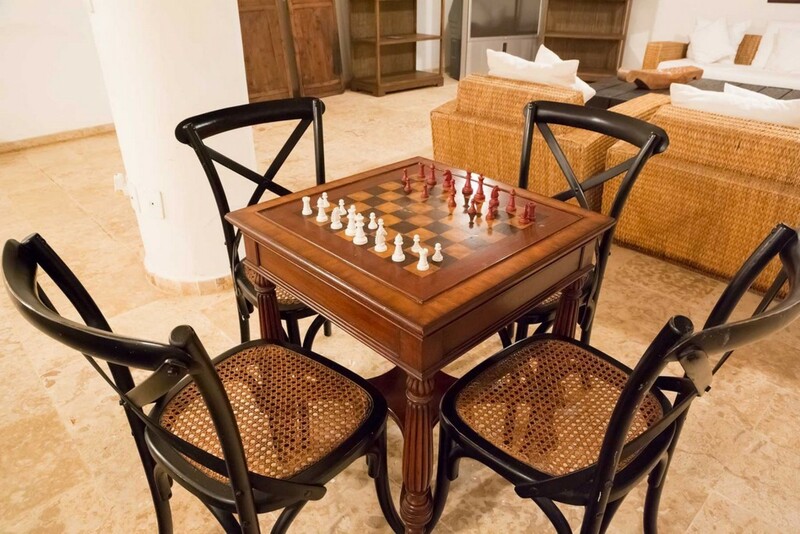 The villa is approximately a fifteen-minute drive from the La Romana Airport (8km). It is based near the tennis center that is easily accessible with a golf cart. The shooting center and hotel are also in close proximity.